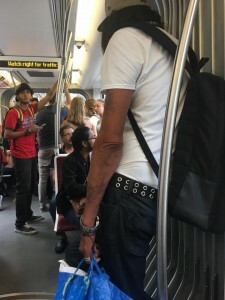 I was on the Bathurst streetcar when I noticed a man standing near the payment machine. He had long straggly hair and was covered in tattoos. His face was hardened and he had an aura that turned people off and cleared a space around him in an otherwise packed vehicle. I was close to him and saw him making a commotion. He had noticed a little Asian woman with grey hair and a cart standing by the door. She was possibly in her 80’s and he was mortified that she was standing. He ordered someone to move and then he walked towards her to help her. She recoiled, but he put his hand out and insisted to help her. She didn’t take that hand but did walk in the direction of the open seat. He made it his mission to clear the path and get her seated. He stood for the next while, head down, weaving slightly. At College St, the older woman made a slight motion that she was about to get up. The man dropped his bags on the floor and jumped into action. He quickly was beside her, intent on helping her. She looked incredibly uncomfortable and was trying to avoid his gaze. He was relentless. He cleared the area and motioned for her to get up. He picked her cart up right off the ground and carried it for her. He got off first placing her cart on the ground before turning to attempt to assist her off. She defiantly avoided him and stepped off alone before scurrying towards her cart. He stood with one foot on the step and one on the pavement until she made it to her cart and shuffled away without a thank you or a look back. I was fascinated by the scene. And I couldn’t help but notice that he walked a little taller when he returned. He had a sense of pride in what he had done and felt inwardly rewarded regardless of her lack of acknowledgement. I understood him. I understood that in a world where people who struggle with addiction and poverty are judged…no worse…ignored and invisible…. they’ve been conditioned that acknowledgement and rewards are not external. His pride came from his actions, not her response. It was sad but profound.